We've taken them several times over they years and are favorite farm is Tougas Family Farm. They have apples, pumpkins, goats, an awesome playground and bakery/store (pretty much everything you can want)! I bought the girls (and myself) a pumpkin. I think it took Ella an hour to pick out her perfect pumpkin. I think she would have walked around the pumpkin patch all day if we would have let her! Ha! Sunday was a GORGEOUS day and perfect for apple picking. We got there right when the orchard opened and the day warmed up quickly! There were SO many apples on the trees which was awesome. We hardly had to move from one spot and our was filled! 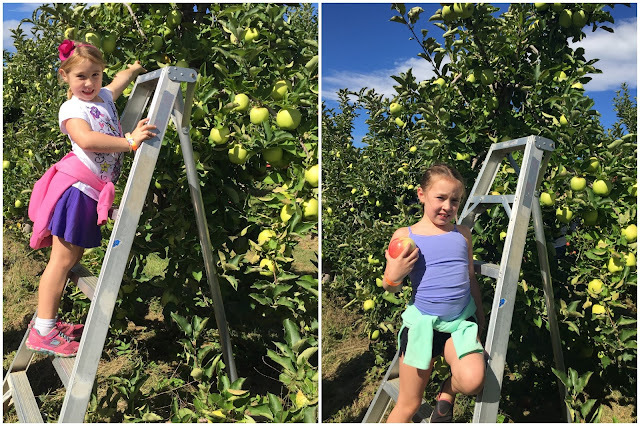 The girls love climbing the ladders to pick the apples but because there were so many apples on the trees they didn't even need to. There were plenty within their reach without the ladders but we let them climb one just for fun! I don't think the sky could have been any bluer! Such a pretty day! I love September in MA! So I wanted to take a photo with the girls with apples in our mouths. Seems easy right!? Well I forgot that Ella doesn't have any front teeth right now which pretty much made it impossible for her to hold onto apple without using her hands. She wasn't too happy about it! See the photo below of me trying to show her how to do it! Lol! I told her to just use her hands and we'll have to have a redo once her front teeth grow all the way in! 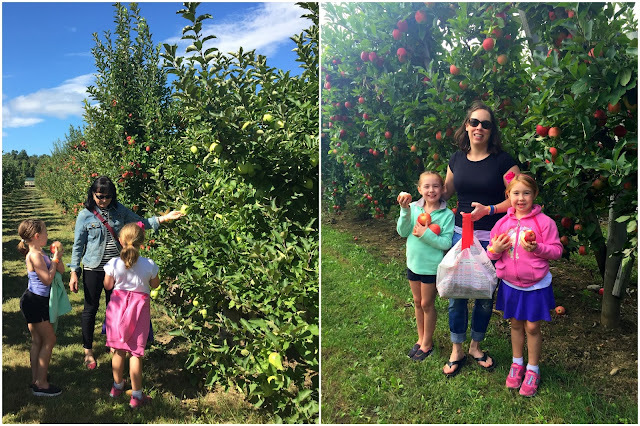 We took the tractor ride back (even though it was really close) b/c the bag of apples was just too heavy to carry! After we finished picking apples we got cider and cider donuts. Then it was off to see/feed the goats and play on the playground but more on that in the next blog post! Oh and I've been eating apples for days!!! Gala are my favorite and they are amazing with some Trader Joe's Cookie Butter. Trust me! I love Tougas! We usually go back and forth between there and Honey Pot Hill in Stow. You got some great pictures and it looks like you had a blast!